Just days before the state visit of Japanese Prime Minister Shinzo Abe to Mar-a-Lago, President Donald Trump’s Palm Beach private club, Florida restaurant inspectors found potentially dangerous raw fish and cited the club for storing food in two broken down coolers. Inspectors found 13 violations at the fancy club’s kitchen, according to recently published reports — a record for an institution that charges $200,000 in initiation fees. Now that’s how you consummate foreign affairs! Poison visiting leaders. Introduce projectile vomiting as an Olympic event. Introduce our allies to the miracle of American health care! Is there anything the shitgibbon touches that isn’t a whited sepulchre? Asking for a friend. Consider this a break from waiting for the war(s) to start. Open thread and all that, with a special request for receipe/dish names to be served at Mar-a-Microbe. 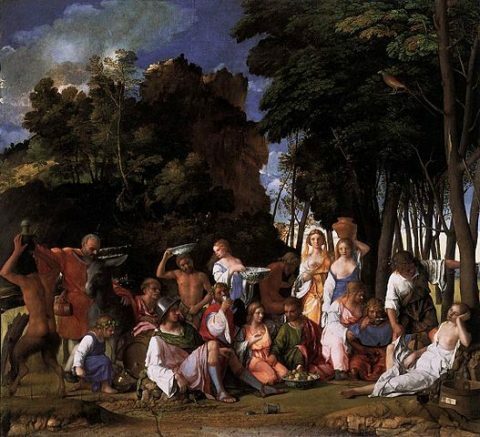 Image: Giovanni Bellini, The Feast of the Gods, 1514. This entry was posted on April 13, 2017 at 5:52 pm and is filed under Moral Trumpitude, Snark, Uncategorized. You can subscribe via RSS 2.0 feed to this post's comments. You can comment below, or link to this permanent URL from your own site. Didn’t Bush 41 introduce the world to the gentle art of throwing up in public on diplomatic missions? Maybe Trump thought it was part of the protocol.